Srikanth Turlapati completed his Post Graduation from Assam University, India and qualified CSIR-NET Junior research fellow in 2011. Currently pursuing his Doctorate degree entitled as “DISPERSION OF CARBON NANOTUBES IN NOVEL BANANA LIQUID CRYSTALS AND STUDY OF THEIR PHYSICAL PROPERTIES” to be submitted to Assam University under the supervision of Prof. Nandiraju V. S. Rao. His research interests include synthesis of achiral unsymmetrical four-ring bent core liquid crystals (BLCs) exhibiting ferro-nematic phases and the influence of substituents in bent-core compounds in the realization long range blue phases in mixtures and multi-functional materials. This Blue Phase texture was obtained in a binary mixture of achiral four-ring bent-core compound bearing a polar cyano group at one end doped with 5% chiral dopant HTP(R-1011). 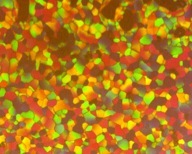 And the picture was taken on Nikon polarizing microscope (with 20X objective) attached with Instec STC 200 hot stage (at 145.4°C) and Nikon Digital sight DS-Fi1 digital camera. Picture width corresponds to 500 microns. Jury comment: Blue phase is not only blue color! The BP picture secleted this month presents colors of the coming Fall season.